https://sep.yimg.com/ay/yhst-33477391359232/banded-serpent-sea-star-ophiocoma-species-brittle-starfish-5.jpgBanded Serpent Sea Star - Ophiocoma species - Brittle Starfish Expert Only!!! Taxonomy: Banded Serpent Sea Star belongs to the Kingdom Animalia, Class Ophiuroidea, Order Ophiurida, Family Ophiocomidae and Genus Ophiocoma. Scientific names: The scientific name of Banded Serpent Sea Star is Ophiocoma species. Other common names: Banded Serpent Sea Star is also commonly known as Fancy Banded Sea Star, Brittle Starfish and Brittle Sea Star. Origin or natural range: The Ophiocoma species originates in the Indo-Pacific region including the Red Sea. Size: Banded Serpent Sea Star grows up to a size of around fourteen inches. Color: The Ophiocoma species occurs in Black, Brown, Tan, Yellow and Red colors. The body color of the sea star deepens with age. Aggression: Banded Serpent Sea Star is non-aggressive towards the marine aquarium invertebrates. Compatibility: The Ophiocoma species is reef compatible. 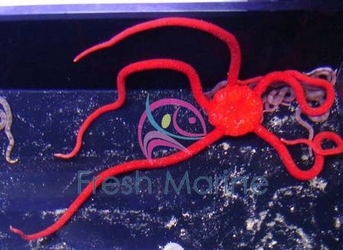 Venom status: Banded Serpent Sea Star is non-poisonous in nature. The Ophiocoma species is Nocturnal in nature and therefore, in its natural habitat, the sea star may be found solitarily or in big groups on shallow reefs, under rocks, in coral crevices or among algae. Banded Serpent Sea Star comes out at night to feed. The Ophiocoma species is quite agile and its wavy movement resembles to that of a snake and therefore the common name. The body of Banded Serpent Sea Star is quite delicate and brittle and can readily fragment. The Ophiocoma species has numerous spines on each side of its five, long arms that are banded in deep Brown color. The arms of Banded Serpent Sea Star are mainly used as sense organs rather than as feeding tools. The arms of the Ophiocoma species are banded in deep Brown color. The central disc of Banded Serpent Sea Star has dark colored patterns. Tank type: To host the Ophiocoma species, you should have an established Reef Type Marine Aquarium. Aquarium set-up: Keep ample quantity of rocks, rock caves, corals and Live Rocks in your reef tank for the Banded Serpent Sea Star to hide in. Water flow in the aquarium: The Ophiocoma species requires moderate water current in the marine aquarium it inhabits. Acclimation: Use the Slow Drip Acclimation Method to slowly acclimate the Banded Serpent Sea Star to your marine aquarium�s environment. The slow acclimation process generally takes a minimum of two hours time period. Diet: The Ophiocoma species is Omnivorous in feeding habit. Food content: Banded Serpent Sea Star eats detritus and small marine invertebrates. Supplements: You may supplement the diet of the Ophiocoma species with zooplankton and the meaty bits of raw shrimp, scallop, mussel, clam and other small crustaceans. You can even directly hand feed the Banded Serpent Sea Star. Benefits: The Ophiocoma species eats detritus and therefore, prevents your marine aquarium�s water from being contaminated due to the decay of organic waste matter. The Ophiocoma species requires moderate care. Copper in any form in your marine aquarium may prove lethal for the Banded Serpent Sea Star therein. Caution: The Ophiocoma species may eat small fish in your marine aquarium, if it is not fed fully. Therefore, be very particular regarding its regular and complete feeding so that it stays calm.